A few ounces of Calexico, a handful of Tom Waits, a pinch of madness and several pounds of Hannes Loeschel. 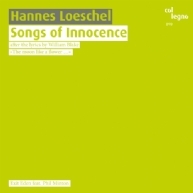 On col legno’s behalf the Austrian composer, a commuter between New Music and jazz, has now tackled a popular work that has greatly influenced many artistic genres in the 20th century: William Blake’s "Songs of Innocence" have been interpreted by artists such as Allen Ginsberg or Benjamin Britten – Loeschel has now introduced this tradition in Vienna. The presumption of innocence as seen by Blake, Minton’s vocal skill and Loeschel’s playful musical transformation of the poems make this production a captivating new release. The musicians of Ensemble Exit Eden, some of them very young, expertly support the composer. Blake’s poems and the illustrations by Willy Puchner they inspired are shown side by side in the booklet. So, what we have here is an audible, visible and readable volume of poems – and, first and foremost, pop music of the col legno kind! Vol. I of our co-operation with mica – music austria, curated by Patrick Pulsinger. Pop! The exceptionally gifted organ-ist, composer and specialist in electronics Wolfgang Mitterer has been thinking about pop music: Sopop, featuring Birgit Minichmayr!